You don’t have to put movie dialogue between the tracks to be “cool “, but it helps. What makes the soundtrack of Oliver Stone’s wrongly-maligned 1994 serial killer satire so special is the way album producer Trent Reznor (Nine Inch Nails) weaves the two together. Leonard Cohen’s lugubrious Waiting For The Miracle segues seamlessly into L7’s ferocious Shitlist via a line from Juliette Lewis (“Arc you flirtin’ with me? **); the intro to the Cowbov Junkies’ Sweet Jane is overlaid with Woody 11 a nelsons announcement, “The whole world’s cornin’ loan end!”; evocative dissolves nu\ Pasty Cline. Di Dre. Jane’s Addiction. Tommy Lee Jones and gunlire to achieve sublime synchronicity. You don’t even have to watch the film. Another immortal modern soundtrack that sticks close to the text by way of the fictional k- Billy’s Super Sounds Of The ’70s radio show. Voiced by deadpan comedian Steven Wright. K-Billy links the tracks (“And if you’re the 12th caller you were in two tickets to the monster truck rally”), as if we are tuned via some imaginary dial into Quentin Tarantino’s record collection. Nuggets such as George Baker Selection’s Little Green Bag, Harry Nilsson’s Coconut and Bedlam’s Harvest Moon, provide a deceptively sunny backdrop for a tale of torture and betrayal. 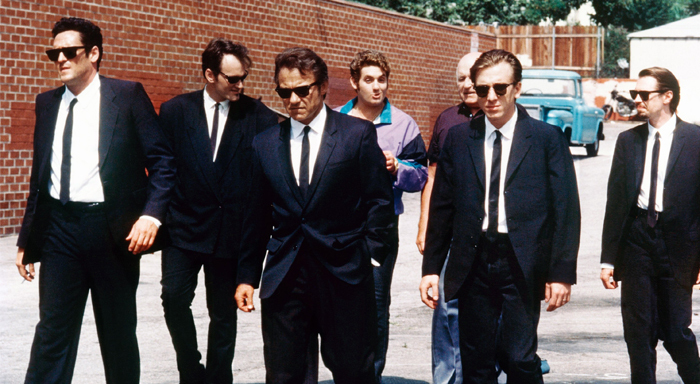 It’s a formula that’s worked for Tarantino again and again, but Reservoir Dogs remains definitive. It starts with The End by the Doors! An inspired choice by Francis Coppola that forever marries song to moving picture it’s existential too (beginning with, like, the end). Encapsulating the soundtrack’s modus operandi, Jim Morrison’s wail merges with the sound of helicopter blades, dialogue, cicadas and Carmine Coppola’s squelchy synth overture. The music, whether off-the-peg or bespoke, is no backdrop or add-on. It’s a vital layer of stimulus, like the famous Wagner-assisted village attack. The double-CD unfolds like one of those old Disney storybook albums, scene by scene. Not a record to put on at a dinner party, but taken with the correct drugs, it’s your ticket to Vietnam. I bet. It’s the “musical supervision “credit for John Barry that says it all. Here in 1969 was a studio picture that defied convention in style and subject (the only X-rated Best Picture Oscar-winner! ), and instead of Barry simply composing a score, he farsightedly gathered together suitable tracks from obscure late-’60s performers (The Groop. Elephant’s Memory, Leslie Miller), ran them in with his ow n pieces and created a hip. atmospheric patchwork of an album. Harry Nilsson’s quavering, stripped-back cover of Fred Neil’s Everybody’s Talkin’ was a smash hit and hey! a great ad for the film. So blame Barry for Celine Dion’s Mv Heart Will Go On. It is a measure of Sofia Coppola’s cool that, instead of going for an experienced movie composer, she hired delicate French pop duo Air to score her heart-stopping 2000 debut. They rose to the occasion, providing not just memorable tunes of the lounge some type found on their own heart-stopping moon Safari (Playground Love, Highschool 1 over), but also gening down and diri> with a real drummer (Brian Reitzel and rocking out). It’s mightily dramatic stuff. The climactic Suicide Underground provides a moving, multi- instrumental coda, based around a slowed-down piece of poetic dialogue by Giovanni Ribisi. Why slowed down? Who cares! Honey for the finale is inspired too (“Walking back to you is the hardest thing I can do”). As with Apocalypse Now, it’s hardly a revelation to name the opening moments of Saturday Night Fever as a perfect union between music and movement: John Travolta, swinging that paint can to the Bee Gees’ Stayin’ Alive. It’s a classic. As is the entire 25-million-selling album, built around seven Gibb compositions, rustled up when producer Robert Stigwood asked if they had anything suitable for what was then called Tribal Rights On A Saturday Night. The song Night Fever was so good they changed the film’s name. Some movies about music reflect their times, others change them. This one led to a disco inferno. Commercially available for the first time in 2001 — an insane 27 years after the release of Coppola’s surveillance thriller David Shire’s almost entirely piano-based score is, at heart, jazz. It’s minimal and desperately sad even the three upbeat numbers seem ironic and points up the gloomy, paranoid mood of the visuals. Shire (brother-in-law of Coppola at the time) was charged with creating something “haunting and lonely’’. He certainly did that. It’s like having Gene L Lackman’s character I larry Caul distilled into CD form. A gem. I defy you to define “cool” and stay fashionable. It can’t be done. One man’s cool is another man’s mid-life crisis tattoo and eyebrow ring. But this is personal, right? These ten soundtracks say ‘’cool” to me. My guess is that most of them are cool, but you will be the judge of that. The bulk are not scores. This is not because orchestral accompaniment of the old school cannot be cool, simply that we have to draw a line somewhere, and if you got me started on the likes of Vertigo or Zulu we’d be here all day. So, the chosen ten are largely collections of songs. Though this is a largely besmirched form, these are a cut above your standard teen movie with a thrown-together ragbag of contemporary/nostalgic rock and pop hits, plus one off-beam cover version, featured in or – shiver runs down spine of music-lover – “inspired by” the film. They say that if Blur had only ever written Song 2 they’d never need work again, thanks to its ubiquity on soundtracks and compilations. Of course. Quentin Tarantino raised the bar, and now his soundtrack albums are better than his films. Admit it. Remember also: a great song does not a cool soundtrack make. Thus, no Die Hard With A Vengeance, despite evocative, scene-setting use of The Lovin’ Spoonful’s Summer In The City before the initial bomb goes off. The ten I have chosen are albums you can put on and listen to. from start to finish, like a proper LP. For the record, those that almost made the cut include Mean Streets, Seven, Trainspotting. Pulp Fiction. The Royal Tenenbaums and Casino Forrest Gump is a debonair selection of old tunes too but, well, it’s Forrest Gump.